The Contemporary collection offers the opportunity to mix and match contrasting colours and textures, to create a look with a modern, clean and Scandi vibe. The four new beautiful door finishes include two matts, a Flat White and Flat Grey and two woodgrains, a subtle Sandwashed White and White Oak. Not only can you mix and match these doors but there is also a dramatic metallic handle trim available in Chrome, Copper and Matt Black. 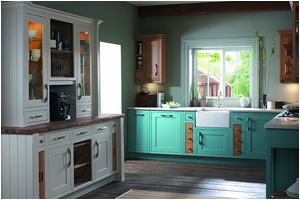 The combinations available from these four colours and three trims provides endless opportunities to create a unique design. There is a wide choice of worktop finishes, 27 different colours and patterns from a 22 mm Coralux solid surface, a 22 mm laminate or a 12 mm compact laminate. The Coralux allows an integrated worktop and basin option for an elegant and fluid finish. The beauty of fitted bathroom furniture is that it makes best use of the available space, making it a perfect solution for both small and large bathrooms. Clever storage solutions, such as the smart 200 toilet roll unit, keep all your bathroom essentials out of sight. 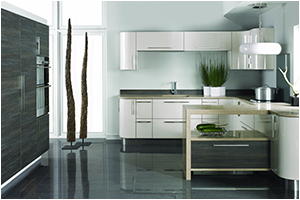 Mirrors and mirror cabinets complete the collection, providing more opportunities to add light and spaciousness to the room. If you are looking for a practical and beautiful bathroom then the new contemporary range could be just what you are looking for, why not call into the showroom to find out more.